I have been a vegetarian for 13 years, that is half my life. Sadly, it took me 13 years to finally make my own veggie burgers. I try not to eat too much soy, since the jury is still out on it’s healthiness what with GMOs and such… so I opted for a black bean burger. Beans are so good for you, they are jam packed with protein, fiber, and vitamins while leaving out cholesterol and saturated fat and all the other yucky stuff meat has. 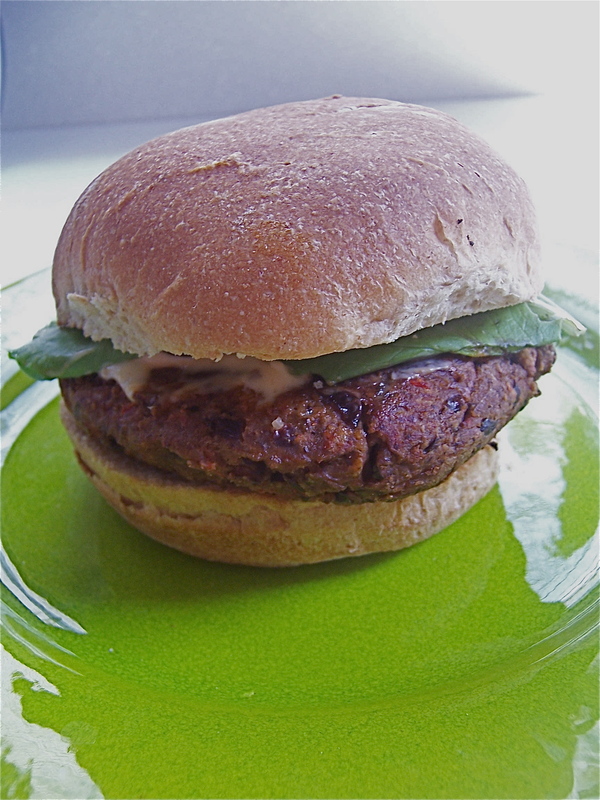 It also just feels so much better to eat a homemade burger, rather than a processed frozen veggie burger. Plus, they are delicious. I have shared these burgers with 3 friends (1 vegetarian, 2 omnivore) and all have requested the recipe. Then friends of a friend requested the recipe, so it dawned on me to put it on my blog. It’s not breakfast, but it’s food from scratch and it’s so good. You have to try these! I suggest making a double batch of these tasty concoctions and freezing them. When I want a quick healthy lunch or dinner I throw one of these babies in a frying pan with a smidge of olive oil, top with baby greens and a whole wheat bun and voila! Ok, so I also use mayo, not the healthiest, but if a smear of mayo is the worst thing you’re eating, that’s not so bad. The chipotle mayo is a perfect companion for this southwestern-y tasting burger. If I am out of chipotles I just mix a little hot sauce with my mayo and it does the trick. You can see where the recipe really lends itself to making a double batch anyway, as it calls for ½ a pepper and ½ an onion. Rinse and drain the black beans. Pat dry with towel to get off excess water. Mash the beans in a medium sized bowl. Set aside. Chop up pepper, onion, and peel garlic. Put the veggies in a blender or food processor and chop/blend (depends if you want pieces or not, I turn mine into a rough puree because I find it helps the burgers keep from falling apart). Drain excess water from the veg mixture, as this helps to keep the patties from falling apart later (I use a coffee filter and colander and let it drain for a few minutes). While the veg mix is draining combine eggs with spices and hot sauce and beat together. Dump veg mix into mashed black beans and combine. Dump egg mix into bean and veg mix and combine. 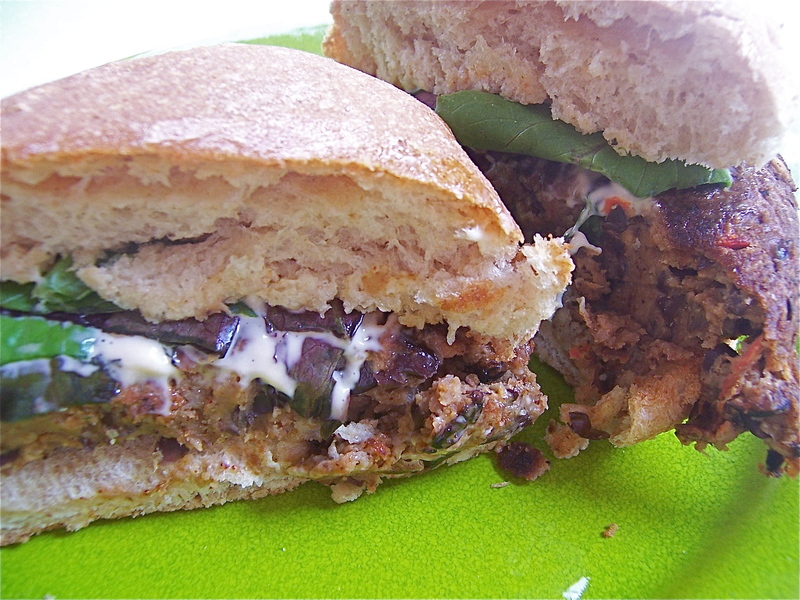 Starting with ½ cup, add bread crumbs until black bean mix comes together and becomes desired texture for burgers. Form into patties. You can bake them (put some parchment or oil on a pan) at 375/400 degrees F (depending on ho much crunch you like), fry them in a little olive oil over medium heat, or grill them. I usually pan fry or grill them and they always turn out great! Top with baby greens (iron and antioxidants!) and chipolte mayo, on a whole wheat bun. Blend chipotle and mayo together in a blender, food processor, or by mashing the pepper with a fork and mixing together. It’s that easy to achieve spicy creamy deliciousness. Now you don’t have to feel bad about those chocolate chocolate-chip muffins! Happy healthy eating!